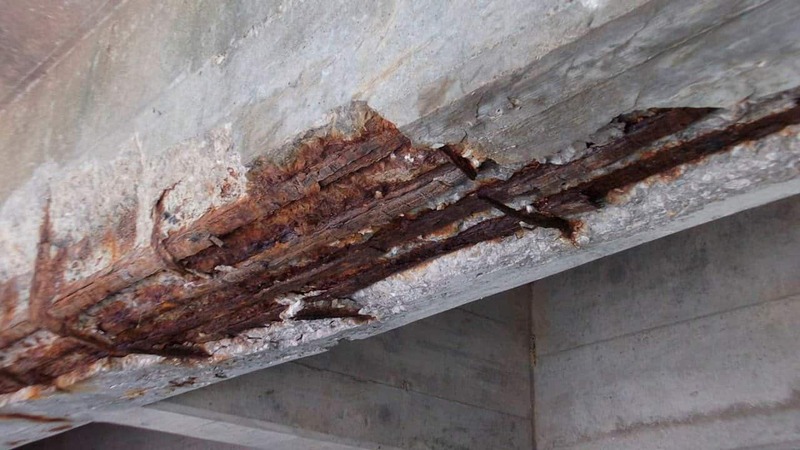 Corrosion in Reinforcement is a serious issue, it can affect the integrity and life of the structure. Concrete has mainly two protection mechanisms to protect the steel from corrosion. The first one is that it forms a physical barrier to avoid the steel come in contact with the external environment. And the other one is that it provides an extremely alkaline environment within which steel doesn’t corrode. After the construction, the concrete is exposed to many environments during its service life. When we focus on the environment which has chlorine in it, it doesn’t affect concrete but it corrodes the steel reinforcement. To effect the steel reinforcement, it must be transported through concrete. Once the threshold of chlorine ions has reached the surface of steel, corrosion starts to occur. Formation of white patches – Atmospheric carbon dioxide reacts with calcium hydroxide present in the cement paste forming calcium carbonate. This calcium carbonate is carried by moisture and deposited onto the concrete surface forming white patches. Brown patches along reinforcement – When the steel bars start corroding, a layer of iron oxide is formed on it. This iron oxide also gets carried to the surface of the concrete by moisture. 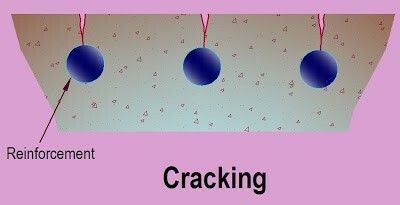 Formation of cracks – The products of corrosion occupy a greater volume than the original material. Hence they exert pressure on the concrete and crack it. With more corrosion occurring, more and wider cracks are formed. Spalling of concrete cover – Due to loss of the bond between concrete and steel, the concrete starts forming multiple layers of scales and peels off. The steel bars also get reduced in size. Snapping of bars – Due to reduction in the size of the steel bars, they finally snap. Also, there is a considerable reduction in the size of the main bars. Buckling of bars – Spalling of the concrete cover and snapping of bars lead to buckling of the main bars. This bulges the concrete in that region and eventually the whole structure collapses. Employing Good Quality Concrete: High quality concrete must be used. It helps to maintain proper alkaline nature. For the concrete, a water/cement ratio of 0.4 or less is to be maintained as excessive water may damage the steel bars. Proper Compaction: Concrete must be sufficiently compacted such that no air voids or air pockets are present in it. Using FBEC Bars: Fusion Bonded Epoxy Coating (FBEC) is applied on the steel bars to prevent them from corrosion. Epoxy powder is spread electrostatically on to the steel bars. The powder melts and flows over the bars upon heating, which forms a protective coating. They are thermoset polymer coatings because application of heat will not melt the coating. Apart from rebars, it also has wide application in pipeline construction. Use of Cement Based Polymers: Cement based polymers can be used in the concrete to enhance its protection against corrosion capabilities. The cement based polymers act as a binder in the concrete. They also increase the durability, tensile strength and vibration damping of the concrete. The Rapid Chloride Permeability Test (RCPT): This test is performed to assess the degree of corrosion. The quantity of electrical current that passes through a sample 50 mm thick and 100 mm in diameter in 6 hours is measured. Based on this, a qualitative rating is made of the permeability of the concrete. Use of Migratory Corrosion Inhibitors: These are to be used in the concrete mix or applied on the hardened surface of the concrete. These inhibitors diffuse through the concrete cover and reach the steel bars to protect them against corrosion. Calcium nitrite based inhibitors are quite common.